Candy Cane Sleighs DIY Christmas Fun! Feel it yet? Christmas is getting closer, and actually coming faster now too. Not much more time is left to get all the last minute shopping done, decorations, and of course some preparations for everyone on this special fun day too! Christmas is one time of year that I search for ideas of things to do, so enjoy the creativity that surfaces during this time, and it's so much fun to do too! These candy cane sleighs are adorable, editable, fun, and are for everyone too! Hand them out to everyone, put in the stockings, display them before they get eaten, and so on. This is something that everyone can do. You just need some candy canes, and some yummy chocolate bars too. Once you have completed the sleigh you can even add some other touches to it like a big bow, have santa sitting on the sleigh....you can get him in chocolate too. Possibilities are endless, so much fun, and in this case....so yummy too! Along with the candy a glue gun is used with just small, light drops of glue used to get everything to hold together. Everything is in wrappers, and is no problem using it. You could find other alternatives maybe if you wanted to also. Maybe use some of the glue dots from the craft stores, and instead of candy wouldn't it be neat to use maybe some packs of gum too. I originally found this idea being shared at DIY Cozy Home, and from there she showed the original source to this. For further instructions visit with Ellyn's Place where she shows pictures, and gives you full instructions for this adorable idea. 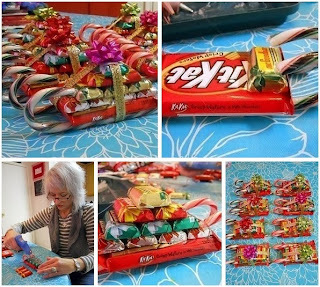 Hope you have fun, and are able to try this candy sleigh idea out too. Thanks for sharing your time with LilacsNDreams, and hope to see you again soon. Have a Happy Day!